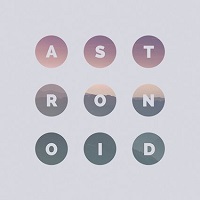 Hailing from Groveland, Massachusetts, ASTRONOID is a “Dream Thrash” band. From their Facebook page, “Creation should feel like a moment of self-actualization. Full potential and promise become fulfilled, and the next step can be taken. ASTRONOID reach such a moment on their self-titled second album. The Boston quartet—Brett Boland (vocals, guitar), Daniel Schwartz (bass), Casey Aylward (guitar), and Matt St. Jean (drums) are releasing their sophomore album, reflecting the ebb-and-flow of two years marked by intense life changes.” Their self-titled here contains nine tracks. “A New Color” opens the album, with a thunderous mid-section and positive tones. Dreamy harmonized vocals come into play. The bottom end is heavy and aggressive while the vocals float like passing clouds. It moved in a melancholy way to completion and makes you feel satisfied. “I Dream in Lines” opens with a meaty drum sequence and light, airy vocals. The verses are solemn and demonstrative with and the Thrashy passages keep your head moving the entire time. The vocals are layered beautifully. “Lost” is the long song on the album at six-and-a-half minutes and opens with depressive tones that turn somewhat angry with a heavy-handed riff that shouts back at you. It’s unlike anything they have done before. Highly emotive, it resonates with your soul. “Fault” opens cautiously but then that Progressive sound is full on. The vocal harmonies shine brightly while the guitars and drums are both tense and seductive. Some ethereal elements here also come into play, giving you pause to reflect. It’s such a pretty song overall…so endearing. “Breathe” is a shorter number more focused on the rhythm, which repeats in an odd time signature that is hard to quantify. The guitars, drums and bass stay unified in their attack, while the vocals lament, coming together at the end in perfect symmetry. “Water” has a lumbering, mid-tempo pace and depressive guitar work. The spirit of the vocals is high but unable to overcome the melancholy instrumentation, until the middle part of the song when the vocals break free and soar. “I Wish I was There when the Sun Set” has a heavy, almost Djenty opening riff that darts in and around the vocals, left to hang out there for your enjoyment. Towards the end, some soaring lead guitars step up to the plate. “Beyond the Scope” is another very different song. The opening riff is almost angry sounding, but those vocals come in to cut against it. The drums have this little block that they hit every now and again and the chord progressions go places that you would not expect. It culminates at the ending with a rousing sound that will make you want to get up and take on the world. “Ideal World” closed the album. It has a tight instrumental section with sanguine vocals. The two push and pull at each other, ending in a chaotic passage that stamps the album like a boss. I was fortunate enough to review their debut album “Air” a couple years ago, and it was like something that I have never heard before. There has been some growth however since that album and is seems the band has fully found their niche. If you haven’t heard them before, I highly suggest that you rectify that immediately. Dreamy vocal melodies are supported by a beefy and tight instrumentation and they’ve lifted them for you to enjoy. It’s so pretty and moving that you can’t help but to be completely seduced by the sound here.